WorldClassRoom FAQs - I'm about to start the final course for my degree program! What happens next? Congratulations! Reaching the final course(s) in your degree program is an exciting time, which should certainly be celebrated! However, before the celebration begins, there are a few things you should do. Most importantly, be sure to complete the petition to graduate. Submitting the petition to graduate initiates a final check of your academic record to ensure you will have met all degree requirements. It is also what sets up up for your degree to be officially awarded at the end of your final term, after your final grades have posted. So, if you do not submit the petition to graduate, you will not officially be a graduate of Webster University! If you are enrolled in an online course, an electronic version of the petition to graduate is available inside of the Online Student Commons, under the Student Forms link in the center of your screen. If you are unable to access or utilize the electronic petition for any reason, you may download a paper version here. After submitting the petition to graduate, be sure also to clear any outstanding holds and balances you may have with the university, and also be sure your correct mailing address is on file. To check on holds, balances and your mailing address, view the information available to you in the Student Academic Services channel of Connections. Completing these items will ensure there are no unnecessary delays in receiving your diploma. 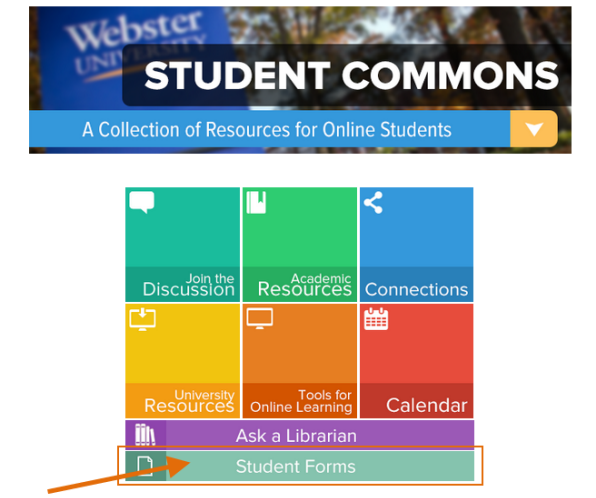 A tip that you will also be able to see the notation that your degree has been awarded, once the information has been added to your record by Webster, by viewing the Academic Record link in Student Academic Services! Diplomas are automatically mailed to students who have no outstanding balances or holds with the university. This process can take up to 12 weeks. If you have a question about your diploma or need to obtain a degree confirmation before your diploma arrives, please contact the Registrar’s Office at (800) 987-3447. An unofficial copy of your transcript is mailed with the diploma. Official transcripts can be obtained by submitting the form found here to the Registrar’s Office: http://www.webster.edu/academics/transcripts.html. You may wish to wait until your degree is officially awarded (view tip above in Step 2) before requesting a transcript, if you need for the transcript to show you have earned a degree. Okay - now you can relax and celebrate your accomplishments! In fact, you should consider attending the St. Louis Commencement, held each May. Find out more information here: http://www.webster.edu/commencement. A list of graduation ceremonies held throughout the year at extended campuses is also available through the left-hand menu on this website.